Muscat 1944 3p Slate. SG1. Unmounted mint 1944 3p Slate. SG1. 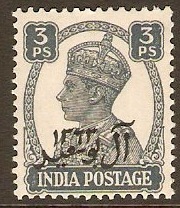 King George V definitive stamp with arabic overprint. Mounted mint 1944 3p Slate. SG1. Muscat 1944 3p Slate. SGO1. 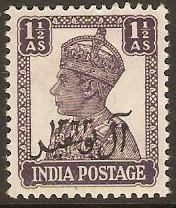 Muscat 1944 ½a Purple. SG2. 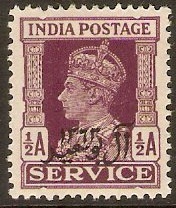 Mounted mint 1944 ½a Purple. SG2. 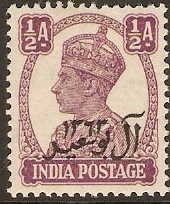 Muscat 1944 ½a Purple. SGO2. Muscat 1944 9p Green. SG3. 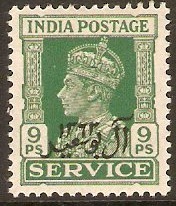 Mounted mint 1944 9p Green. SG3. 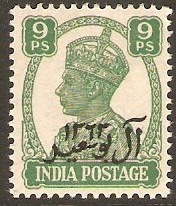 Muscat 1944 9p Green. SGO3. Muscat 1944 1a Carmine. SG4. 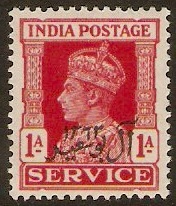 Mounted mint 1944 1a Carmine. SG4. 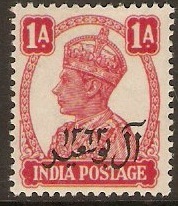 Muscat 1944 1a Carmine. SGO4. Some damage 1944 1a Carmine. SGO4. 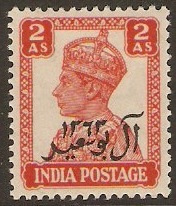 Official stamp. NOTE: Light diagonal crease. 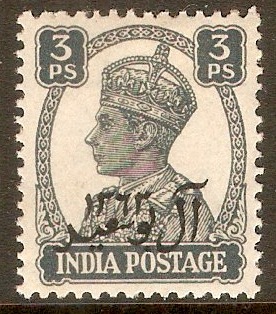 Muscat 1944 1½a Dull violet. SG5. 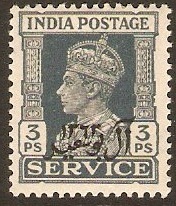 Mounted mint 1944 1½a Dull violet. SG5.